“I am optimistic about the prospects for 2017, in terms of both financial performance – – the individual operations are all off to a very good start – – and likely further progress in our strategic divestment program. Public market sales of additional shares are either already underway or planned in Bangladesh, India and Sri Lanka; the initial results from this effort should be disclosed in the next several weeks. Additional asset sales are planned for later in the year. So the company has finally decided on a course of action, and it will try to sell their stakes in the public market. With Retail Holdings owning a 72.8% stake in Singer Bangladesh, a 75.0% stake in Singer India and a 79.7% stake in Singer Sri Lanka this will take time. Presumably they will also not sell everything at once, but I’m guessing that in twelve months time Retail Holdings will look very different than from today. This NAV calculation is still using some stale numbers since the 2016 annual report hasn’t yet been published (should be coming in the next few days). 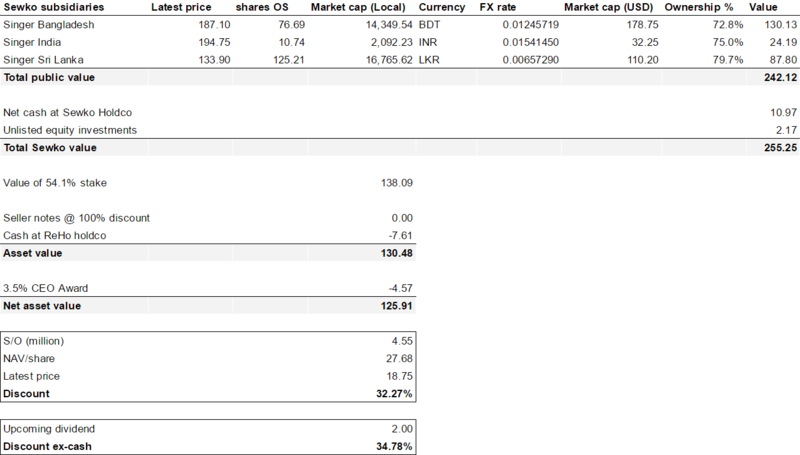 Most likely there is now a bit more cash at the ReHo holding company level (they are planning to pay a ~$9 million dividend after all), but since the majority of the value sits inside the three publicly traded subsidiaries it should still be reasonable accurate. Given the imminent liquidation of the company I think a ~35% discount is quite attractive, and I added a bit to my position at the market open. This entry was posted in Portfolio and tagged RHDGF on March 29, 2017 by Alpha Vulture. Thank you for the update. The share price is currently around $20 with the news but you can get ~10% return in a few month with the $2.00 dividend. I wonder what you think is the fair value of the stock at this point. I’d say pretty close to NAV.